The other day I was browsing Facebook, as I usually do, and I came across an article titled “15 animals that are endangered of going extinct in the next 10 years” or something along those lines. Most of them I’ve seen before like polar bears, Sumatran tigers, rhinos, etc, and the vaquita. Then I saw a picture of one of these and immediately was like, “what is that! I have to talk about it”, thus commencing my internet search for this Endangered Thursday post. The shoebill, also known as the whale headed stork, or Balaeniceps rex, is quite a fascinating creature. It’s blueish gray in color, has yellow eyes and stands about 5 feet tall. I’m 5 foot 7 inches myself and this bird can almost look me in the eye just standing there! The name is derived from the size and shape of it’s beak. It looks almost like an elf shoe or a clog with the hook on the end but definitely not as soft and fuzzy as one. Most people relate the look of this species to a stork, a pelican or a heron but it’s more like all those 3 combined and then some because this species is highly evolved. If you’re wondering where this beastie resides, you’d have to travel to the wetlands and swamps of Africa to see them. They are endemic to the areas of Southern Sudan, Uganda, Tanzania and Zambia. 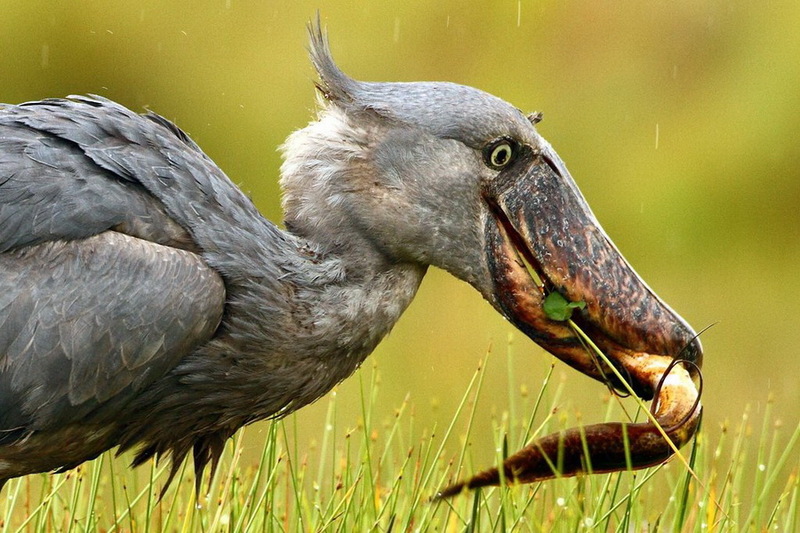 These areas are plentiful of what the shoebill loves to eat: lungfish. However they snack on other things as well. Shoebill have been known to eat other smaller fishes like catfish and tilapia, eels, frogs, monitor lizards, turtles and baby crocodiles. That’s right, BABY CROCODILES! The mandible on this bird is insanely strong and it can crush hard exoskeletons like cracking open a hazelnut. They are quite smart too. They are very good at standing still for extended periods of time. What they do is stand very still, like a statue, in the area of their prey and they almost blend in with the vegetation surrounding them — striking when the opportunity presents itself. They usually gulp up a mouthful of vegetation along with their prey so they’ll shake their heads to be rid of the vegetation (because vegetables are gross 😉 ) and then decapitate their prey while it’s in it’s mouth before final consumption. Shoebills are very solitary animals. It’s very rare that you’ll see them in a group unless it’s mating season. They also do not migrate like regular birds unless the lungfish move then they’ll generally follow them. Breeding season occurs at the start of the dry season. When a shoebill mates, it’s monogamous but also the males and the females participate fully in the rearing process from building the nest to keeping the eggs incubated or cooled. Eggs hatch once a year because it takes a while for a shoebill to fledge. It takes 30 days for an egg to hatch and then 95 days for the the hatchling to fledge. During this time the parents feed the chicks regurgitated food multiple times a day. Once they fledge, it takes about another 30 days for them to be able to fly and once they fly they are independent of their parents. Shoebills live about 36 years in the wild. Shoebills don’t really have any predators because they protect their habitats aggressively. Humans don’t bother them either. They’ll usually just have a staring contest. Shoebills are important to the ecosystem however because they keep the lungfish and some of the other swamp creatures populations in check. The natives borderline fear these birds but they bring money to the area through ecotourism. Shoebills are listed as Vulnerable on the IUCN Red List because they suspect there are only about 5,000-8,000 individuals remaining. This is one step above Endangered. They are protected by law in the countries they inhabit but habitat destruction is the number one cause for population decline. The swamps and wetlands they rely on to survive are being converted into agricultural land for farming and cattle grazing. There is also what’s known as the zoo trade. Shoebills in zoos are in high demand so the natives will capture the shoebirds and sell them for up to $20,0000 dollars to zoos. If shoebills breed in captivity, it’s highly likely that hatchlings will imprint on the zookeepers making it impossible to ever release them back in the wild when they’re adults. As of now there are no conservation plans to save the shoebill or conservancies taking donations but this is one bird that has eyes on it because nobody wants it to become endangered or even worse, extinct. Check out the video below to see the shoebill catching its prey in action! Isn’t this one of the most prehistoric, robotic looking animals you’ve ever seen?? Whoa! How beautiful! I love its coloring and also its eyes. 36 years is a fairly long life for a bird, isn’t it? How amazing. I can’t say that I’ve ever seen this bird and it almost looks prehistoric to me. I hope they will make a plan to conserve these creatures before it’s too late. Farming is always such an issue for our animals. Awesome post, Nel. I can’t wait to read this with the kids later. 💖 You’re part of our Thursday curriculum! Wow a 5ft tall bird that isn’t an emu or ostrich. Who knew? You know Darlene that’s a very good point! They’re right up there but a smaller build if you discount the whale beak, haha. I love birds, watch a lot of documentaries and read a lot. I see. Now I envision you being this fantastic writer as well as an awesome artists drawing these magnificent bird portraits and landscapes! I wish, I have no artistic talent for drawing whatsoever. I just love wildlife and the world it lives in. Baby crocodiles?! Wow!! Gosh yes it looks so prehistoric!! This is such an interesting post!! Thank you for sharing!! I really enjoy reading about them!! That is one funky looking bird. It does look… uhm, … what’s the word I am looking for… different. Let’s go with that!